I feel it’s only fair to preface this review with a mild disclaimer. While I have loved movies for as long as I can remember, documentaries are seldom my ideal form of entertainment. Documentaries set out to inform first and entertain if possible, so it’s important for the viewer to have a great interest in the subject matter to really enjoy it. I found this to be the case with KJB: The Book That Changed The World, a documentary about the birth of the King James Bible. 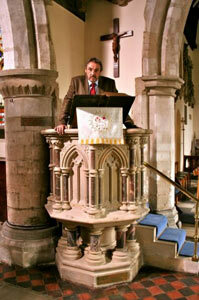 The thing that KJB has most going for it is the fact that it is presented by beloved actor John Rhys-Davies. Film fans would most recognize Davies from his role as the dwarf Gimli in the Lord of the Rings trilogy and an aid to Indiana Jones in the first and third films from the 80s. In between Davies’ narratives in KJB are interviews from professors and experts on the topic, as well as reenacted period scenes that are done quite professionally. These segments are well-acted and dressed beautifully, but these scenes often lack a bit in presentation. Whether it’s the content of some of the scenes are not quite intriguing enough or that perhaps the message being presented could have been done more effectively, I’m not sure, but some of these sequences seem to weigh the film down. For instance, at the beginning of the dramatization, we see a frail and weathered Queen Elizabeth talking to one of her assistants during a prolonged scene where their dialog sets up the discussion of James becoming her successor. During the entire scene, Elizabeth is arranging flowers in a vase while her assistant just stands there talking to her as they exchange dialog that is meant to key us in to how the two kingdoms relate to one another. The actors are decent in their respective roles, but nor the material or the performances are quite interesting enough to probably even warrant the scene being included over the facts being presented in narrative form instead. 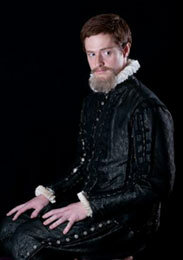 Rhys-Davies’ booming, theatrical voice and charming personality make all of his scenes narrating the story more engaging than much of the reenactment portions. It’s evident that he has a personal fascination with the story of King James and the birth of the King James Bible and his passion trickles down throughout most of KJB. However, due to a decent performance by the actor who played King James, he’s quite stern when he’s supposed to be, often coming off like a heartless jerk, until Davies’ narrative reminds us that he was a brilliant and noble king. KJB gets off to a considerably slow beginning unil James orders the creation of the Bible and the story gets off the ground. Before then, the documentary spends a lot of time on not only how James came to power, but how he was raised from birth. It really is an extraordinary story, but it might have been told in a bit more engaging way. After we learn of the process scholars went through to convert the texts to the new translation, an attempted assassination on King James’ life before the Bible was finished, and then the tumultuous finish to his reign, Davies takes us on a stroll through the halls of Oxford where we see first-hand one of the original twelve printings of the translation, as well as other texts that have survived four centuries. This is a great documentary for history buffs and fans of the beloved translation of God’s Word. The documentary is approved for families, but do keep in mind that the film talks about some dark times in history for England and Scotland. Themes such as Queen Elizabeth’s death (we see her on her deathbed in the very first shot of the reenactment scenes), violence in the society, attempted assasinations on the king’s life, and burial of the famous royal members are all touched upon during the film. We briefly see a messenger who was injured during his travels with some slightly bloody scrapes on his face, while another scene shows a miscellaneous man with a somewhat graphic (albeit rather fake looking) bloody wound on his chest and lots of blood on his clothes. The latter of the two is especially startling and unexpected. Otherwise, the rest of the violence is spoken of but not seen. 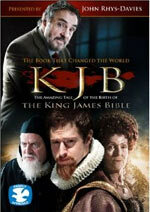 KJB: The Book That Changed The World may not be the best or most engaging documentary you’ll ever see, but the filmmakers do a respectable job of bringing to light the origin story of one of mankind’s most treasured translations of God’s Holy Word. 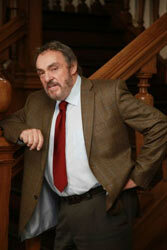 While the dramatizations are wonderfully dressed in detailed costumes and our host takes us to many actual locations where pivotal moments occurred, the real gem of KJB is John Rhys-Davies and his classy and charming screen presence (and there’s a great little interview with him as a bonus feature on the DVD). KJB: The Book That Changed The World will probably make a great Sunday School tool and something for history fans to sink their teeth into, but anyone looking for a really engaging experience (like Michael Apted’s 2007 Amazing Grace, for example), should probably pass this by. Blood/Gore: We see a messenger who travels to tell James that he his king who has a slightly scratched and bruised face after we hear (but do not see) that his horse had trampled him; We see some men carry a miscellaneous man into the castle, where a very young James is spying through a door, who has blood all over his clothese and a fake-looking but very bloody wound on his chest.